Pictured: Prime Minister The Hon. 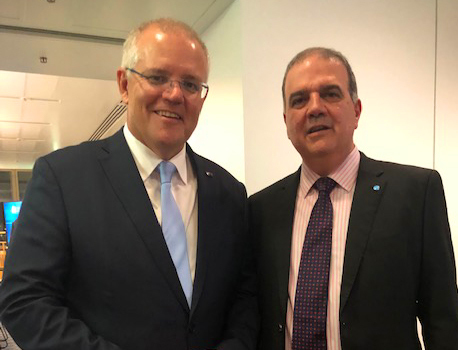 Scott Morrison MP with ARRB CEO Michael Caltabiano at the announcement of Federal Budget funding for ARRB. The 2019 / 2020 Budget delivered by the Morrison Government is to be commended on their $2.2bn boost to road safety. ARRB - your National Transport Research Organisation - are delighted to contribute to the delivery of this excellent initiative through the provision of expertise that spans 60 years. As a component of the budget package announced, ARRB has been named to receive $2.6m to assist local governments to assess their road asset management and maintenance requirements with a focus on regional areas. It's recognition of ARRB’s role supporting Local Government across Australia. ARRB will formulate a new suite of technical manuals for the benefit of all local governments. In addition, ARRB have been funded to acquire next generation devices to assess in-situ the aging status of seals for rural and regional Australia to better predict performance and optimise maintenance strategies; ensuring a focus on informed, predictive maintenance.